I have motion installed with a picamera. If I start motion from the console, it's fine. but I can not configure it as a daemon. And I get an error: "Failed to enable unit: File motion.service: No such file or directory"
I've been with this for several days. What else can I do? This command is not necessary. that should get it running a boot time. Imarmisa: in file/etc/default/motion I have written "start_motion_daemon = yes"
: Unit motion.service could not be found. I have permission problems. what should I do? Change permissions to the /var/run/ folder? What permissions should I put? I have checked here that the file /etc/default/motion should not include any blank space character. 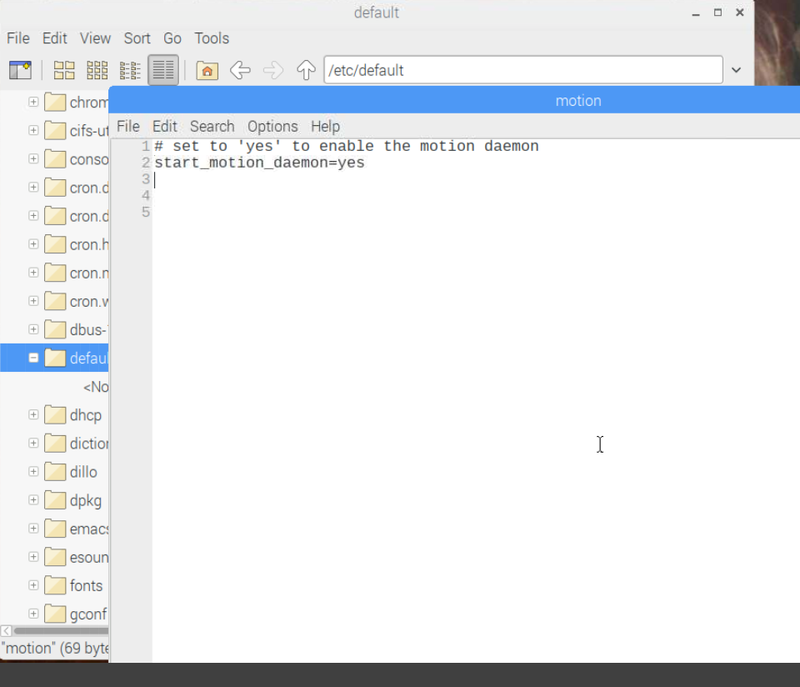 If motion detects a syntax error (blank space), the daemon is not started. the blank spaces are introduced by the Google translator when some text with non-alphanumeric characters is pasted in the source window ... I forgot to correct it. In fact, the syntax is fine in the motion file. My problem is the permissions. How can I avoid "problem creating directory /var/run/motion: Permission denied" and "can not create process id file (pid file) /var/run/motion/motion.pid: Permission denied"
This behavior is good. The user pi has no privileges for running motion but root is able to run that program. In the previous example, /usr/bin/motion is running as user motion and process 608. Jul 23 06:34:11 raspberrypi systemd: Started Update UTMP about System Runlevel Changes. Jul 23 06:34:11 raspberrypi systemd: Started Hostname Service. Jul 23 06:34:11 raspberrypi systemd: Startup finished in 1.445s (kernel) + 8.777s (userspace) = 10.223s. Jul 23 06:34:11 raspberrypi systemd: Started Virtual filesystem service. Jul 23 06:34:11 raspberrypi systemd: Mounted FUSE Control File System. Jul 23 06:34:12 raspberrypi avahi-daemon: Joining mDNS multicast group on interface wlan0.IPv4 with address 192.168.1.19. Jul 23 06:34:12 raspberrypi avahi-daemon: New relevant interface wlan0.IPv4 for mDNS. Jul 23 06:34:12 raspberrypi avahi-daemon: Registering new address record for 192.168.1.19 on wlan0.IPv4. Jul 23 06:34:12 raspberrypi systemd: Started Authorization Manager. Jul 23 06:34:13 raspberrypi systemd: Started Disk Manager. Jul 23 06:34:13 raspberrypi systemd: Started Virtual filesystem service - disk device monitor. Jul 23 06:34:13 raspberrypi systemd: Started Virtual filesystem service - digital camera monitor. Jul 23 06:34:13 raspberrypi systemd: Started Virtual filesystem service - Media Transfer Protocol monitor. Jul 23 06:34:13 raspberrypi systemd: Started Virtual filesystem service - GNOME Online Accounts monitor. Jul 23 06:34:13 raspberrypi systemd: Started Virtual filesystem service - Apple File Conduit monitor. Jul 23 06:34:58 raspberrypi systemd-timesyncd: Synchronized to time server 193.145.15.15:123 (2.debian.pool.ntp.org). Jul 23 06:34:58 raspberrypi systemd: apt-daily.timer: Adding 44min 43.034771s random time. Jul 23 06:34:58 raspberrypi systemd: apt-daily-upgrade.timer: Adding 18min 5.823990s random time. Jul 23 06:35:20 raspberrypi kernel: [ 57.049169] w1_master_driver w1_bus_master1: Family 0 for 00.800000000000.8c is not registered. Jul 23 06:36:23 raspberrypi kernel: [ 120.638132] w1_master_driver w1_bus_master1: Family 0 for 00.400000000000.46 is not registered. Jul 23 06:37:14 raspberrypi kernel: [ 171.397314] w1_master_driver w1_bus_master1: Family 0 for 00.c00000000000.ca is not registered. Jul 23 06:38:31 raspberrypi kernel: [ 247.835754] w1_master_driver w1_bus_master1: Family 0 for 00.200000000000.23 is not registered. Jul 23 06:39:34 raspberrypi kernel: [ 311.435274] w1_master_driver w1_bus_master1: Family 0 for 00.a00000000000.af is not registered. Jul 23 06:40:12 raspberrypi kernel: [ 349.357523] w1_master_driver w1_bus_master1: Family 0 for 00.600000000000.65 is not registered. Jul 23 06:40:53 raspberrypi kernel: [ 389.847090] w1_master_driver w1_bus_master1: Family 0 for 00.e00000000000.e9 is not registered. Jul 23 06:41:56 raspberrypi kernel: [ 452.834190] w1_master_driver w1_bus_master1: Family 0 for 00.100000000000.9d is not registered. Jul 23 06:42:35 raspberrypi kernel: [ 491.953911] w1_master_driver w1_bus_master1: Family 0 for 00.900000000000.11 is not registered. Jul 23 06:43:50 raspberrypi kernel: [ 567.196256] w1_master_driver w1_bus_master1: Family 0 for 00.500000000000.db is not registered. Jul 23 06:44:42 raspberrypi kernel: [ 619.160102] w1_master_driver w1_bus_master1: Family 0 for 00.d00000000000.57 is not registered. Jul 23 06:45:08 raspberrypi kernel: [ 645.598333] w1_master_driver w1_bus_master1: Family 0 for 00.300000000000.be is not registered. Jul 23 06:45:08 raspberrypi systemd: Reached target Network is Online. Jul 23 06:45:11 raspberrypi systemd: Started Daily apt download activities. Jul 23 06:45:11 raspberrypi systemd: apt-daily.timer: Adding 9h 54min 56.907510s random time. Jul 23 06:45:11 raspberrypi systemd: apt-daily.timer: Adding 9h 53min 4.350699s random time. Jul 23 06:45:58 raspberrypi kernel: [ 694.999028] w1_master_driver w1_bus_master1: Family 0 for 00.b00000000000.32 is not registered. Jul 23 06:46:37 raspberrypi kernel: [ 734.279426] w1_master_driver w1_bus_master1: Family 0 for 00.700000000000.f8 is not registered. Your system started at 06:34:01 (Jul 23 06:34:11 raspberrypi kernel: [ 9.924340] Bluetooth: RFCOMM TTY layer initialized) but the first event shown on syslog shows the time 06:34:11 (Jul 23 06:34:11 raspberrypi bluetoothd: sap-server: Operation not permitted (1)). No luck. One hundred lines were too few. This procedure will work much better. Jul 23 09:19:24 rpi5 motion: Starting motion detection daemon: motion. Jul 23 09:19:29 rpi5 motion: [0:motion] [ALR] [ALL] conf_cmdparse: Unknown config option "ffmpeg_deinterlace"
Jul 23 09:19:29 rpi5 motion: [0:motion] [ALR] [ALL] conf_cmdparse: Unknown config option "sdl_threadnr"
Motion was started only 1 second after the first kernel event shown in the log file. Then with grep motion /var/log/syslog no line comes out, and the new syslog has about 600 lines. Last edited by mugurdi on Tue Jul 24, 2018 2:56 am, edited 1 time in total. We are looking in a wrong file (/var/log/syslog). According to your configuration the log file is /var/log/motion/motion.log. Take a look at this file in order to find information about the error. I deleted /var/log/motion/motion.log, I made reboot and no file called motion.log is created. I'm thinking about reinstalling everything: in addition to motion what should I reinstall: ffmpeg? More things? I appreciate your help, because I'm lost. The software used to work fine several months ago! There is no line, that is, motion has not started. Feb 17 07:28:33 raspberrypi motion: [0: motion] [ALR] [ALL] conf_cmdparse: Unknown config option "widht"
Unit motion.service could not be found. It seems you have the same issue as me. Motion used to work with both a USB camera and the pi camera but now I cannot get it to work at all! Important step is to make that folder writeable! Thanks but this did not seem to make any difference? Srill have exactly the same problem..
# consult the documentation for the complete list of all options. # Start in daemon (background) mode and release terminal. # Start in Setup-Mode, daemon disabled. # File to store the process ID. # File to write logs messages into. If not defined stderr and syslog is used. # Level of log messages [1..9] (EMG, ALR, CRT, ERR, WRN, NTC, INF, DBG, ALL). # Video device (e.g. /dev/video0) to be used for capturing. # The full URL of the network camera stream. # Name of mmal camera (e.g. vc.ril.camera for pi camera). # Image width in pixels. # Image height in pixels. # Text to be overlayed in the lower right corner of images. # Always save pictures and movies even if there was no motion. # Threshold for number of changed pixels that triggers motion. # Noise threshold for the motion detection. # Despeckle the image using (E/e)rode or (D/d)ilate or (l)abel. # Number of images that must contain motion to trigger an event. # Gap in seconds of no motion detected that triggers the end of an event. # The number of pre-captured (buffered) pictures from before motion. # Number of frames to capture after motion is no longer detected. # Command to be executed when an event starts. # Command to be executed when an event ends. # Command to be executed when a movie file is closed. # Create movies of motion events. # Maximum length of movie in seconds. # Port number used for the webcontrol. # Restrict webcontrol connections to the localhost. # Type of configuration options to allow via the webcontrol. # The port number for the live stream. # Restrict stream connections to the localhost. # Directory to read '.conf' files for cameras. Feb 21 19:29:44 raspberrypi systemd: Started LSB: Start Motion detection. Feb 21 19:29:47 raspberrypi systemd: Started LSB: Start Motion detection. Feb 23 21:55:44 raspberrypi systemd: Started LSB: Start Motion detection. is there any way I can see where motion is failing to load/run from the diagnostics?